Solution Tender: Everybody dies, but not everybody lives. 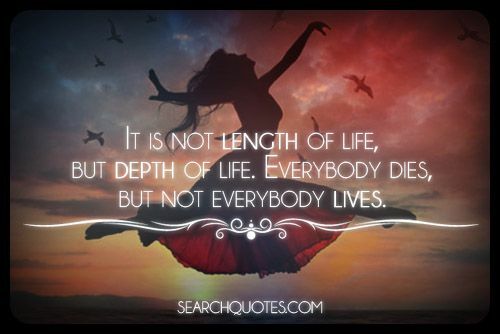 It is not length of life, but depth of life. Everybody dies, but not everybody lives. Though it would be great to live a long life, it should be more important to you to live a life that is filled with more depth, with more purpose, and with more achieving goals, than to just outlast everyone around you. Your life is about your legacy and what you will eventually leave behind to the rest of the world. What kind of story will your life tell by the time that it is over? What kinds of people will you affect by refusing to give up, and by dreaming as big as possible in each day. Never live your life attempting to just make it as long of a life as possible. Be sure to make steps each day towards your goals and aspirations. Be sure to live in each moment as much as possible. Engage with people on a daily basis and let them see who you really are deep on the inside. Don't hold back just to hold on, live everyday proactively.